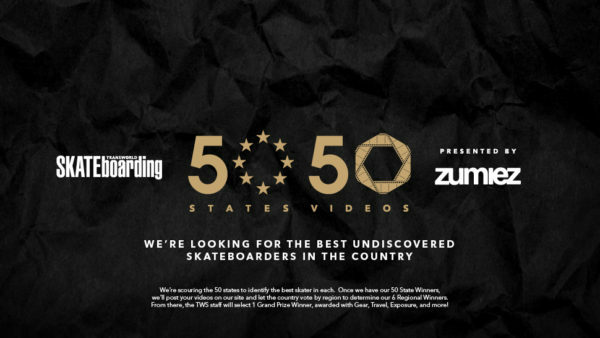 The TransWorld 50/50 Video Contest is back! We've partnered with Zumiez once again to identify 50 Winners in 50 States through a video contest hosted on TWSkate.com. Once we have our 50 State Winners, we'll post your videos on our site and let the country vote by region to determine our 6 Regional Winners. From there, the TWS staff will select 1 Grand Prize winner, who will be awarded with Gear, Travel, Exposure, and more! This is your time to shine. Start stacking those clips and spread the word to your hometown hero. Here’s a look at last year’s winner, Matt Bullinger, and his winning trip to California. Click the image below to submit your edit!